It’s been a huge amount of work, but we finally have some conclusions. First and foremost, the dips have now been observed by an instrument other than Kepler. So we can firmly rule out instrumental effects! (This was already clear, but it’s now true beyond all doubt for the dips). 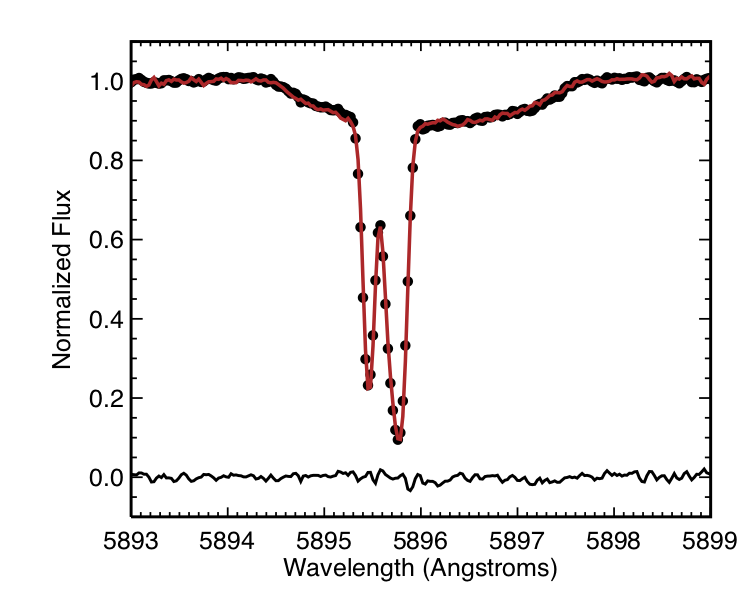 Analysis of LCO data by Eva Bodman. Eva Bodman has done a lot of work to characterize how much deeper the dips are at blue wavelengths than red ones. If there were opaque objects blocking our view of the light, the star should get equally dim at all wavelengths. Instead, Eva finds that the blue (B) dips are much deeper—about twice as deep—as they are when we look at infrared wavelengths (i’ band, just beyond human vision). This is consistent with ordinary astrophysical dust, and a major conclusion of our paper: the dips are not caused by opaque macroscopic objects (like megastructures or planets or stars) but by clouds of very small particles of dust (less than 1 micron in typical size). We can also say that these clouds are mostly transparent (“optically thin” in astrophysics parlance). The broad sodium line from the star forms a shallow bowl, the sharp features are due to interstellar clouds containing sodium between us and the star. The black points and red line in the figure above are from before and during the dips, respectively, and the black line at the bottom is the difference. As you can see, there is no obvious change in the spectrum at all. This strongly suggests that the dust causing the dips is not accompanied by much neutral sodium. What about hot gas? If it’s really hot there shouldn’t be much in the way of dust, but if it’s warm there should be ionized calcium. How do the calcium lines look? The broad calcium line from the star forms a shallow bowl, the sharp features are due to clouds containing calcium between us and the star. Again, no change, so it looks like there is no additional ionized gas accompanying the dust. So the dust—if that’s what it is—seems to be by itself with no accompanying gas. In fact Jason Curtis has gone further, and shown that there does not appear to be any change in the stellar lines, either, during a dip, meaning the star is not moving, so does not have a nearby companion orbiting it. So where are our 10 possibilities? As I wrote, instrumental effects (#1) are now firmly ruled out. The hypotheses I found most plausible involving an interstellar gas and dust cloud (#3 and #4), are not looking great. There should have been atomic gas in that case, and we see none. My favorite (but “less-plausible”) hypothesis #5, a black hole disk, has not been similarly developed, so I think is still in play because we’re not sure what we would have expected to see for that one yet. A cold disk of dust could easily have had all of its gas frozen out onto grain surfaces, I suspect. The unlikely hypotheses of an orbiting black hole disk (#6), spherical swarm of megastructures (#9) and pulsations (#12) continue to be unlikely. But now even the more generic “alien megastructures” hypothesis (of any geometry) takes a severe blow from the chromatic nature of the dips: no opaque objects seem to be causing this. I suspect this will be the big headline here, so let me reemphasize: if the dips had been the same color at all wavelengths, we would have been scratching our heads and this hypothesis would be looking better than before (though still of unclear likelihood). The fact that the data came in the other way means that we now have no reason to think alien megastructures have anything to do with the dips of Tabby’s Star (Recall that Meng et al. had already come to a similar conclusion with respect to the long-term dimming, but it was the dips that got us thinking along these lines in the first place). I still like the Solar System cloud idea (#2) but until it is developed to the point where we know what colors of dimming we would expect for a Solar System cloud, it remains of “unclear” plausibility. The fact that the stellar lines did not change velocity during a dip helps us rule out pulsations (#12, if the star changed size then its atmosphere would be moving and would have a changing radial velocity) as well as close companions. Tabby had already ruled out the nearby companion hypothesis (which is why it wasn’t even on my list) but we now have independent confirmation. Hypotheses invoking circumstellar material seem to be doing well. Steinn and I were originally pretty down on this class of solutions because of the lack of infrared excess and their inability to explain the long-term dimming, but Metzger et al. and Wyatt et al. (2017) ‘s models have shown how this could be explained, bringing this class of hypothesis up the plausibility scale to near the top (in my mind). To remind you, Wyatt et al. explain both the long- and short-term dimming with circumstellar material, while Metzger et al. have the long-term dimming being intrinsic and the dips due to exocomet-like debris). We were also down on the family of solutions involving intrinsic variations, and we still don’t think the polar spots model (#11) and stellar cycle model (#10) have high likelihood. But in addition to the Metzger et al. 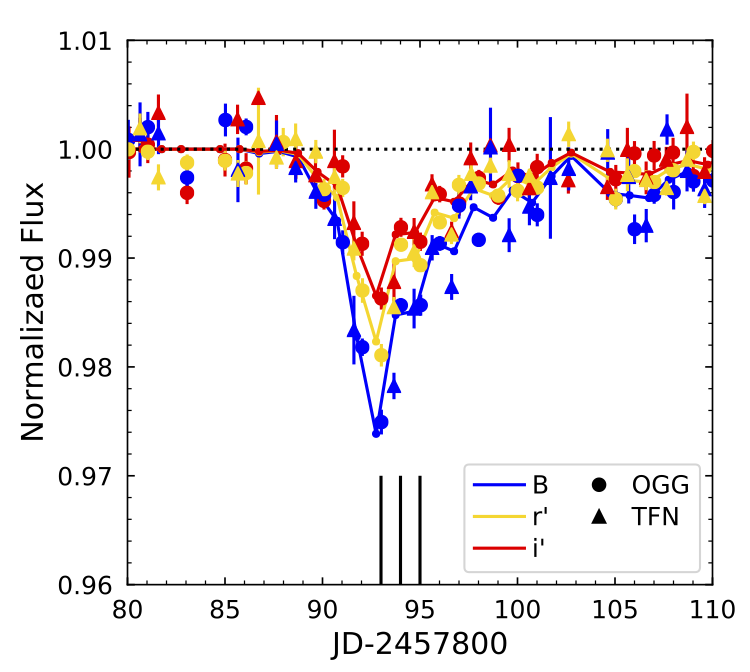 hypothesis, Peter Foukal has developed a model where the entire star gets cooler, and this model is also consistent with the data (I think the dips seem to be too deep in the blue, but formally it’s consistent at the “2-sigma” level). Indeed, Peter himself finds the dips to be less chromatic than we do and very consistent with his model. So I’m ready to promote this class of solution up, in particular because it predicts no absorption features accompanying dimmings, which is indeed exactly what we see. As for the circumstellar material solutions (“exocomets”), I’m not personally sure why that model does not predict neutral and ionized gas to accompany the dips, but I don’t think anyone has worked it out in detail yet, so it could be easy to explain. Wyatt et al. and Metzger at al. have developed models involving circumstellar material like exocomets that seem to be consistent with the data we have. Wyatt et al. and Foukal have developed models where the star itself is getting dimmer that also seem supported. Both classes of model are now at the top of my list, though I still see major problems with both. Hypotheses invoking intervening material like an interstellar cloud, seem to have taken a blow, though I still want to understand better if they are really ruled out by the lack of gas in the spectra, and whether circumstellar material like exocomets is similarly ruled out. I’m still fond of this solution, but it has gone down a notch in light of the new data. I think my black hole disk hypothesis is still a dark horse in this race. And the instrumental effects and alien megastructures hypotheses have been put to bed. So that’s where we are. The next highest priorities (in my mind) are to scrutinize the in-dip spectra for any signature of the occulting material (I’m especially curious if the diffuse interstellar bands change depth), and modelers need to make detailed predictions of the atomic and ionized gas that should accompany dust in the exocomet, interstellar cloud, and black hole disk models to see if they can be made consistent with our in-dip spectra. This entry was posted in science, Uncategorized on December 26, 2017 by jtw13. For those just catching up on Tabby’s Star, read Kimberly Cartier’s article in Scientific American and my series of blog posts here. And don’t read or trust anything the Daily Mail writes on this (or any other topic involving me). 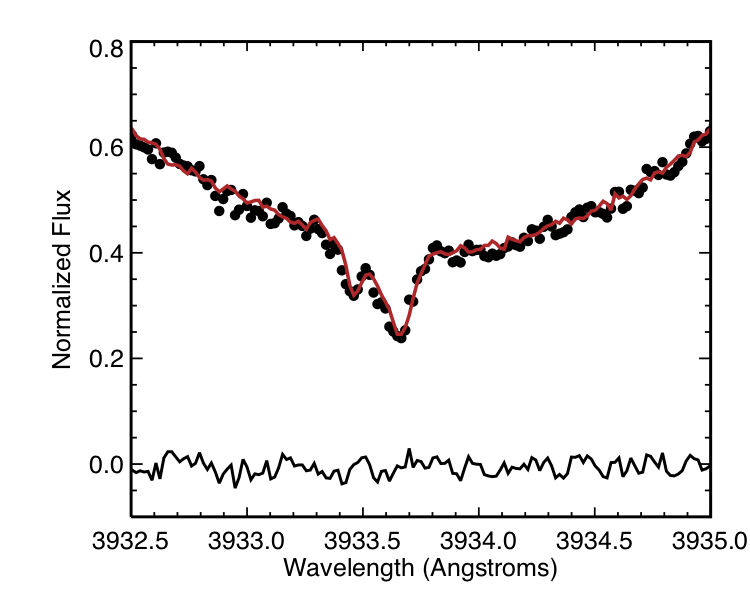 The star exhibits two unique and very difficult to understand behaviors: the short-term”dips” in brightness (of up to 22%) and long-term brightness variations on years-to-centuries timescales. Since the Kepler mission stopped observing it, it seems to have continued it slow decline in brightness over the past few years, and that dimming does not seem to be due to solid objects. But we still don’t have any information about what’s responsible for the dips because we hadn’t been able to see one happening in real time. But now, thanks to the generous support of our Kickstarter backers, Tabby’s team has been able to pay for year-long monitoring of the star with the Las Cumbres Observatory global telescope network to “catch it in the act” of dipping again so we can study what’s going on. Since then, Tabby’s team has been able to collect a huge amount of data not only from our own organized follow-up efforts, but thanks to he amazing generosity and interest of astronomers around the world who volunteered to observe the star during the dips. We sincerely appreciate their contributions, and they are all authors of our latest paper. In this plot, the different colors represent different LCO sites where data were taken. The brightness of the star is on the y-axis, and the date (measured in days with an arbitrary offset astronomers like to use ) is on the x-axis. One of the rewards for our Kickstarter backers was to name the various dips (they need names!). After the first (“Elsie”, a nod to Las Cumbres Observatory (“LC”) who was one of our most generous backers), the star continued to oblige with a series of dips. The next dip, “Celeste,” was named as a near reversal of “Elsie” when it looked like the two events might be exhibiting time symmetry (it’s also a nod to team member Angelle Tanner’s mother, who sadly died around the time of the event). The subsequent events have started a theme of “lost cities” which it seems the backers would like to maintain going forward. After all of that, the star exhibited a strange brightening for a couple of months. To recap, we were hoping that once we finally caught a dip happening in real time we could see if the dips were the same depth at all wavelengths. If they were nearly the same, this would suggest that the cause was something opaque, like a disk or (whispering) alien megastructures. 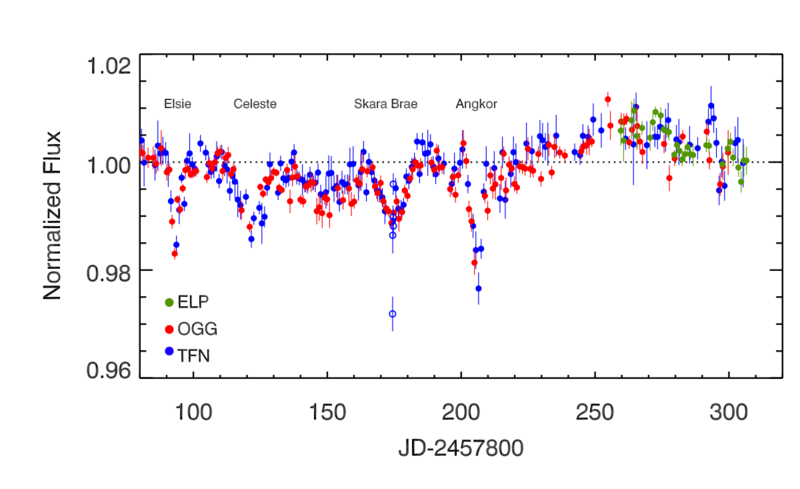 The long-term dimming doesn’t seem to be the same at all wavelengths, which suggests it’s being caused by something like ordinary astronomical dust, but that doesn’t tell us what’s causing the dips (which are what got everyone excited in the first place). So, what have we found!?! Well, our paper with a huge author list has been accepted by Astrophysical Journal Letters (thanks to a quick and conscientious referee) and we’re ready to reveal what happened in part II. Three updates to the ‘Oumuamua story! The key is that in space, things generally rotate in a very simple way, about the “principal axis” with the largest moment of inertia (smallest radius). This is because this is the axis for which a given angular momentum has the least energy, and over time objects will lose energy but not angular momentum. The Earth, for instance, is oblate, and rotates along the shortest axis it has. But if you just start something spinning arbitrarily (or, say, you knock it around) or if you start it spinning with some motion along its intermediate axis, it will execute a much more complex motion (around 2:00 in the video above) called tumbling. It will do this in space until the changing distortions of the body from the changing centrifugal forces eventually cause the rotational energy to dissipate away as waste heat and it ends up a principal axis rotator again (that’s why the Discovery One in 2010:Odyssey Two is spinning that way, along its shortest axis). 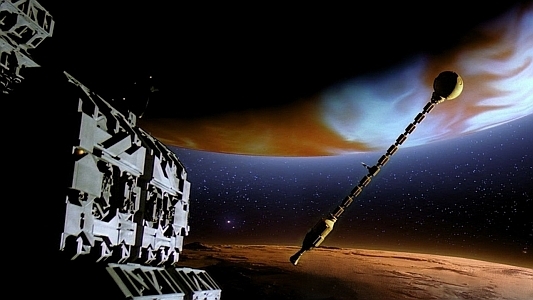 The Discovery One is spinning when he Alexei Leonov comes to find it because it had angular momentum but no attitude control, so eventually found the lowest energy state, which was a spin about its shortest axis. So why is ‘Oumuamua tumbling? It’s unclear, but it may be related to its elongated shape: unlike typical Solar System “rubble pile” asteroids and icy comets, it seems to have more rigidity (apparently not uncommon in smaller Solar System objects), and so it dissipates its rotational energy more slowly—so slowly that it can tumble for a long time. This is neat! We should be thinking about what we will do if something that looks (more) like an alien craft comes through the Solar System. Now the Breakthrough Listen team has a protocol for tracking Solar System objects with Green Bank and analyzing the data they collect. Such a discovery would imply that there are lots of these things in the Solar System at any given moment (even if they are deliberately targeting the Sun, they are hard to spot and we’ll miss most of them), and so lots of opportunities to study them. Why would there be so many of them? Part of the argument that it is possible to settle the entire Galaxy is that exponential growth is possible, because the only limiting resource is the stars (and the material around them) themselves. Exponential growth can be achieved via Von Neumann probes: self-replicating spacecraft that go to a system, make lots more of themselves, and then go to more systems. Now even if these have purposes that don’t involve coming near the Sun, you might expect some fraction to eventually go derelict (space is a harsh environment, and an optimal design will likely have a nonzero failure rate). Such derelict craft would, if they are not traveling so fast that they escape the Galaxy, eventually “thermalize” with the stars and end up drifting around like any other interstellar comet or asteroid. This entry was posted in science, Uncategorized on December 12, 2017 by jtw13.